In The Lost Recipe for Happiness there is a recipe for Pomegranate Baklava. It is the invention of a surly, beautiful gay chef who is Elena’s nemesis for much of the book. I’ll be serving it at booksignings and wanted to be sure I remembered how it all went together (of course I tested it several times during the Major Winter of Cooking, which you may remember from blogs here). So, yesterday, I gathered all the ingredients and my camera, my Ipod and Santa Fe Cooking School apron, and made a fresh batch, documenting it for you, faithful readers. Every book eventually reaches a place where it is no longer revised (even if that moment only arrives when it’s ripped out of our clutching hands), but that is not true of recipes. As anyone who has ever tweaked a recipe over time knows, a recipe is an adventure. By the time I sent the book to my editor, I was pretty happy with this recipe. Buckwheat honey was important to the plot, so I went with it. For singings this time, I am bringing the baklava, and last week, I made batch to test it (as it has been more than a year since I finished the book). It seemed the buckwheat was overpowering the pomegranate, so I switched to a lighter honey, cut the water and instead used entirely pomegranate juice. Because I was having trouble with the pomegranate arils on top scorching, I added the final nuts and arils at the end of baking. 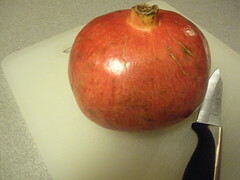 I adore pomegranates. They are absolutely luscious, packed with great nutrients, and very low in calories. I bought a couple for the baklava and a couple to nibble on between bouts of extreme cookie baking. Next, bend the rind to release the seeds over a bowl of water. The inner skin will float to the top and you can skim it off with your fingers. Drain the water and you have a delectable bowl of arils. As you see, you will probably need to open two pomegranates, one for eating, one for the baklava. This was a big hit at the signing. You’ll have to let me know if you try one version or the other. I finished your book and I have to tell ya, afterwards, I sat for a long couple of minutes and digested (no pun intended) the whole thing. Should have had a cigarette. It was that good. Baklava. Love it. I’m going to try this recipe and I’ll let you know. How I wished I lived on the west coast. But since I don’t, I will attempt to make this at some point. The description in the book is mouth-watering! Oh how glorious and I especially love the visuals… I have never seen (read looked for!) 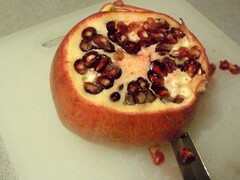 pomegranates before… living in Sydney – do they have them?! I shall go on the hunt because this is just too mouthwatering and inviting to not try! Teri, are pomegranates hard to find in the east? Amanda, I have no idea if they have poms in Sydney. Any other Aussies want to weigh in? Let us know, Amanda. I wish you all the best with your new book. I was in your memoir class at the SBWC 2008. The woman who’s writing about her one year in Belize. I’m going to try your recipe for pomegranate baklava. Thanks, Sonia! Good to see you. I live in Texas, and I have a pomegranate bush in my back yard. We get about seven or eight each year, minus the year we moved it from the front to the back. We had an Asian family in our house before us, and apparently, planting a pom bush in direct line with your front door brings good luck. BUT … it’s really ugly. 🙂 We kept it and replanted it in the back to appease the neighbors, who were quite worried for us. I tried your recipe with a few changes. You don’t need the cardamom or the pistachios. I just mixed the pom. seeds in the nuts and sprinkled them on layers of filo dough – Sprinke lightly on each sheet after buttering each one until you have 6 or 7 layers (layer 10 butered sheets on bottom first) and then topped with 10 buttered sheets on top. Also, I didn’t sprinkle nuts and seed on top because I was afraid they would burn. By the way, 450 is way too high to bake baklava – after 20 minutes it almost burned. A temp. of 325-350 is plenty. Also, if you sprinkle water on the top just before baking, the filo stays crisper. I have been making baklava all my life but found this and will be using it on the sweet table at my daughter’s November wedding for something different. It is delicious.